Eric Dubay made the purported list of 200 “proofs” Earth is not a spinning ball. These are the list of his “proofs” and links to the rebuttals elsewhere on this website. Links open in a new tab. This is a work in progress. New rebuttals are being added regularly. 14 “The Lieutenant-Colonel Portlock experiment used oxy-hydrogen Drummond’s lights and heliostats to reflect the sun’s rays across stations set up across 108 miles of St. George’s Channel. If the Earth were actually a ball 25,000 miles in circumference, Portlock’s light should have remained hidden under a mile and a half of curvature. Speculation. Not necessarily related to the shape of the Earth. No rebuttal necessary. 38 “To quote Reverend Thomas Milner, “In the southern hemisphere, navigators to India have often fancied themselves east of the Cape when still west, and have been driven ashore on the African coast, which, according to their reckoning, lay behind them. This misfortune happened to a fine frigate, the Challenger, in 1845. How came Her Majesty’s Ship ‘Conqueror,’ to be lost? How have so many other noble vessels, perfectly sound, perfectly manned, perfectly navigated, been wrecked in calm weather, not only in dark night, or in a fog, but in broad daylight and sunshine – in the former case upon the coasts, in the latter, upon sunken rocks – from being ‘out of reckoning?’” The simple answer is that Earth is not a ball. Nelson and Sydney are located on the different latitudes. The quoted distance should be the great circle distance, not longitudinal distance. The quoted distance was wrong, it should have been 1307 statute miles, not 1550 statute miles. The great-circle distance from Cape Horn to Melbourne should have been 5681 miles, not 10500 miles. He did not provide his calculations, and it is impossible to point out how he got it wrong. See #40. At the moment there’s no non-stop flight between Johannesburg & Buenos Aires. But there are non-stop flights from Johannesburg to São Paulo, which is sufficient to prove Dubay’s claim is wrong. There’s no non-stop from Santiago to Johannesburg. But there are direct flights between São Paulo & Johannesburg, and it is sufficient to probe Dubay’s claim is wrong. This is a conjecture. Arctic and Antarctic regions are similar in many ways. But there are differences mostly due to the fact Antarctica is a massive continent, but the Arctic is an ocean. This is the fallacy of the single cause. There are factors other than latitudes determining temperature, such as the fact that Antarctica is a continent, but the Arctic is an ocean. Saharas and Himalayas are on the same latitude, but with very different temperatures. The fallacy of the single cause. There are causes other than latitudes determining biodiversity. Saharas, India, and Indochina are on the same latitude, but with vastly different biodiversity. Wrong. At places of comparable latitude, the Sun behaves the same with the comparable position of the Sun. Wrong. At places of comparable latitude, dawn and dusk happen exactly the same on the comparable cycle of the Sun. Wrong. At places of comparable latitude, North and South, they receive the same amount of sunlight on the same cycle of the Sun. Wrong. An observer located north of the Arctic Circle and south of the Antarctic Circle is able to observe the midnight sun (and polar night) at some point in a year. This can be explained using a globe. The absence of evidence is not evidence of absence. And there are in fact, many of such videos. 71 degrees South is beyond the Antarctic Circle (~66.5°) and thus will experience polar nights at some point in a year. This is in line with expectations in the spherical Earth model. She failed to account for the obliquity of Earth’s rotational axis. This is a tall tale. It is impossible to identify a ship from 200 miles away, even using today’s technology. And it is impossible to ascertain the distance is 200 miles. This is a tall tale. Polaris is not visible south of the equator. All the mentioned constellations are circumpolar only if the observer is at a latitude close enough to the pole. The Crux is circumpolar if the observer is located at -33° or more to the South. Only people in southern ends of Australia, New Zealand, Southern parts of Chile & Argentina, and the southern tip of South Africa can see Crux all night, every night. Sigma Octantis is harder to see because of its high magnitude. He should say ‘altitude’ instead of ‘declination’. A star is visible at some point on a specific location if its declination is within the latitude of the observer plus & minus 90°. The Ursa Major is a huge constellation spanning the declination of +30° to +73°. An observer on -30° will be able to see any stars having declination up to +60°, at some point in a year. This allows seeing most of the Ursa Major constellation. Everything is consistent with the spherical Earth model. Vulpecula has the declination between +20° & +30°. Taurus has the declination between -2° & +31°. Pisces has the declination between -6° & 33°. An observer on -55° will be able to see stars up to +35°, including all of Vulpecula. An observer on -65° will be able to see stars up to +25°, which includes the majority of Taurus, Pisces, and Leo. An observer on +65° can see stars up to -25°, which covers all of Aquarius and most of Libra. An observer on +80° can see stars up to -10°, which covers most of Virgo. An observer on -80° can see stars up to +10°, which covers most of Virgo. An observer +85° can see stars up to -5°, which covers most of Orion. An observer -75° can see stars up to +15°, which covers most of Orion. The geographic south pole is different from the magnetic south pole. The same thing happens with the north pole. With such “reasoning”, we can also “prove” the north pole does not exist. This is a made up “explanation” of their flat-Earth model and no claim was made. No rebuttal is necessary. This is a made up “explanation” on how something might work on a flat Earth. No rebuttal is necessary. Daily cycle is determined by the apparent solar position., not the apparent position of distant stars. This is the fallacy of appeal to the stone: dismissing an argument as absurd without giving proof of its absurdity. Here he uses the fallacy of appeal to emotion. Moon lesser gravity does NOT supersede Earth’s gravity. It is the reason only tides happen, but the oceans do not fly away into the surface of the Moon. 118 “Furthermore, the velocity and path of the Moon are uniform and should therefore exert a uniform influence on the Earth’s tides, when in actuality the Earth’s tides vary greatly and do not follow the Moon. Earth’s lakes, ponds, marshes and other inland bodies of water also inexplicably remain forever outside the Moon’s gravitational grasp! If “gravity” was truly drawing Earth’s oceans up to it, all lakes, ponds and other bodies of standing water should certainly have tides as well. Dubay used Mars as an example, but he could easily use the much larger Jupiter or Saturn where it would have been much easier to ascertain the shape of the planet. And it would fit the pictures published by NASA. This is not “proof”, and requires no rebuttal. We cannot measure the size and distance of the Sun and Moon from their apparent size alone. Technology evolves, so is the accuracy and precision of such measurements. Time of day is determined by the apparent position of the Sun. Thus, sundials should always be accurate. On the other hand, timekeeping devices that don’t rely on the motion of the Sun will require calibrations. This is a pure conjecture, not “proof”, and does not require a rebuttal. That the Coriolis effect causes swirling water in sinks is actually a myth. The Coriolis effect is not strong enough to cause it. The fact Dubay used this as “proof” can be considered strawman fallacy. He is right. And we can sometimes see a very clear horizon if the distance to the horizon is well within our visibility range. If the Earth is flat, we would never be able to see a clear horizon, and the horizon will always be blurry. If we were to assume Earth is motionless, then it is how it would appear. But we have to disregard all the other observations in conflict with such an assumption, like the phase of the moon and eclipses. By definition, a geodetic survey is “a survey of a large land area in which corrections are made for the curvature of the earth’s surface” (Merriam-Webster Dictionary). All the quoted elevations are relative to sea level, which is spherical. The Coriolis effect is too small for an aircraft. The pressure is lower if we go higher. 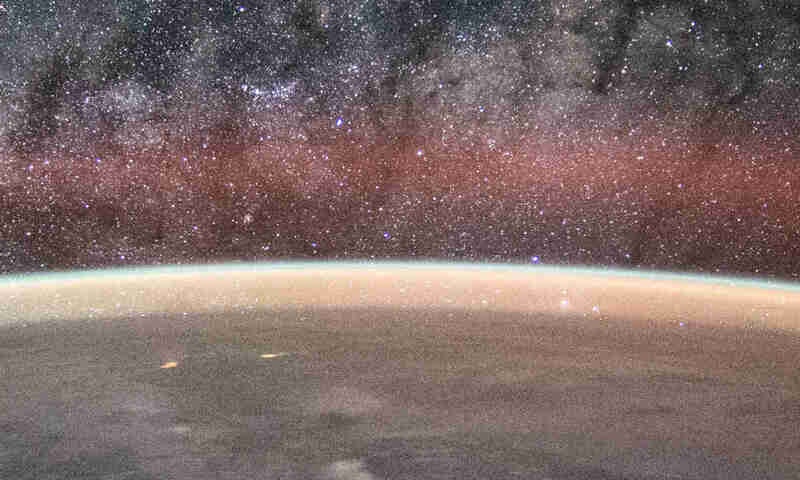 There’s no distinct boundary between atmosphere and space. The trajectory of the ISS can only be determined by its orbital parameters and such calculations are possible only if the Earth is a sphere. This is a conjecture. Satellite phones have been proven to work in areas without any cell phone towers, such as in the middle of an ocean. Geostationary satellites are always above the equator. A receiver north of the equator needs to point south, and vice versa. The motion of satellites is predictable and we can know in advance when and where a satellite will be visible. Such predictions can only be made using the spherical Earth model. This is wrong. We can see the movement if we look carefully. It is harder to see it because Galileo’s footage is in low resolution. With higher resolution footages, like from Himawari-8, we can easily see the motion of clouds. This explains more about Eric Dubay himself than about NASA. Such psychological phenomenon is called pareidolia & apophenia. The picture was probably not the original picture from NASA, and flat-Earthers were the ones who did the cut and paste themselves. 177 “In the documentary “A Funny Thing Happened on the Way to the Moon,” you can watch official leaked NASA footage showing Apollo 11 astronauts Buzz Aldrin, Neil Armstrong and Michael Collins, for almost an hour, using transparencies and camera-tricks to fake shots of a round Earth! They communicate over audio with control in Houston about how to accurately stage the shot, and someone keeps prompting them on how to effectively manipulate the camera to achieve the desired effect. First, they blacked out all the windows except for a downward facing circular one, which they aimed the camera towards from several feet away. This created the illusion of a ball-shaped Earth surrounded by the blackness of space, when in fact it was simply a round window in their dark cabin. Neil Armstrong claimed at this point to be 130,000 miles from Earth, half-way to the Moon, but when camera-tricks were finished the viewer could see for themselves the astro-nots were not more than a couple dozen miles above the Earth’s surface, likely flying in a high-altitude plane! This is a strawman. Yes, the existence of Google Earth is not proof the Earth is a sphere. However, we can use it to confirm distances, etc, and it will fit with the real world. With enough confirmation, we can be sure it accurately represents the actual Earth. Traveling in a car is not constant in velocity. Roads are not perfectly smooth. And the engines vibrates. If we can feel it, then we are affected by an acceleration from somewhere. Motion sickness occurs when an incongruity comes about between visually perceived movement and the vestibular system’s sense of movement. Our vestibular system detects acceleration, not speed. The Earth does not induce acceleration to us other than the Earth’s gravitational acceleration and centrifugal acceleration. 187 “The second law of thermodynamics, otherwise known as the law of entropy, along with the fundamental principles of friction/resistance determine the impossibility of Earth being a uniformly spinning ball. Over time, the spinning ball Earth would experience measurable amounts of drag constantly slowing the spin and lengthening the amount of hours per day. As not the slightest such change has ever been observed in all of recorded history it is absurd to assume the Earth has ever moved an inch. There’s practically no matter in space, and space does not induce friction to Earth’s rotation. Earth’s rotation is actually slowing down due to tidal friction. Due to tidal interaction, the Earth’s rotational kinetic energy is being transferred to the Moon, causing the Moon to go faster and slowly move away from us. 188 “Over the years NASA has twice changed their story regarding the shape of the Earth. At first they maintained Earth was a perfect sphere, which later changed to an “oblate spheroid” flattened at the poles, and then changed again to being “pear-shaped” as the Southern hemisphere allegedly bulges out as well. Unfortunately for NASA, however, none of their official pictures show an oblate spheroid or pear-shaped Earth! All their pictures, contrary to their words, show a spherical (and clearly CGI fake) Earth. The figure and motion of the Earth is a matter of real-world observation, not a belief system. Some religions do rely on the knowledge of the real shape of the Earth, which is spherical, to perform their rituals. That proved the rest of human civilization has progressed, but flat-Earthers have not. It is wrong to say “unable to advance one single real proof”. This is a sweeping generalization and cannot be specifically rebutted. There are actually plenty of proofs and readers are welcome to peruse other parts of this website. No propaganda is necessary unless you are pushing a model that does not conform to reality, like flat Earth. His teacher was definitely wrong to use such an analogy. But it is not “proof” Earth is flat.